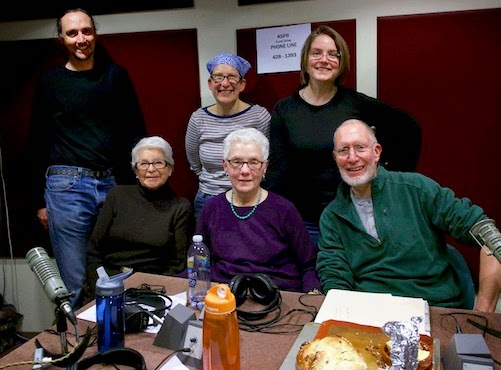 Today's Mouth of Wonder was recorded live and in living color with Stacy Pearl and: Monica and Bram Meehan; Bram's parents, Jim and Marsha Meehan; Mother-of-Rula herself, Bernice Pearl; and the always-fabulous Gabriella Marks, who brought freshly-baked challah! We start with a little catch-up chit chat and then talk to Bernice about her new media Diva fame due to her excessive knitting (she knit over 1,000 hats this year). In the seasonal recipe of the week, we make El Salvadorian quesadillas which have nothing to do with quesadillas as we know them. These are delicious breakfast treats. Bram chimes in with his preferred brunch cocktail, the Mai Tai. Next Rula arrives to answer the questions of her people and chat with Marsha about altitude un-adjustment. We follow that with what’s hot and what’s not-in the food world, food trends, and Santa Fe specific stuff. Monica’s internet food site update is next, and as always it's very informative. Gabriella asks what to do with random leftovers and tries to stump me. The excellent ingredient of the week is bok choy, and finally Jim and Marsha chat about some historical dinners they have been attending back home in Connecticut. And now you have wasted an hour of 2014. Smith Island Cake, the Maryland State Dessert, as mentioned in the show. Photograph by Gabriella Marks. See more scenes from Smith Island here. Thanks to everyone for participating in the show and thanks to Gabriella for getting it on the site so fast and for tempting me with that delicious slice of cake which now I will have to bake! Finally got around to listening to the podcast— thanks for changing my intro music, Stacy! Google Me, Baby! LOL! As an addendum to the conversation about Podcasts - another one to audition is the podcast produced by "America's Test Kitchen".